It has all the hallmarks of a classic Western — farmers in cowboy boots fighting against a big gold mine, led by a gruff-talking Australian boss, in the dusty heartland of Thailand. But the struggle over the Chatree mine and its impacts on local health really comes down to a lack of clarity in Thailand over what levels of naturally occurring toxic substances are considered safe. Australian company Kingsgate Consolidated owns 48 per cent of the mine. Chairman Ross Smyth-Kirk said he was frustrated the debate over alleged contamination could hamper the company's efforts to extend their mining license, which expires next month. "Not only has nobody died, nobody has even been sick or shown any symptoms of anything and yet we still go on with this giant farce," Mr Smyth-Kirk said. "If the stupidity of these people [protesting] was to come to light, it would have amazing economic ramifications for this area." A recent visit by four government ministers to the site drew about 3,500 supporters and at a separate event, about 500 protesters turned out. Opponents said the mine had poisoned local residents, crops and livestock. 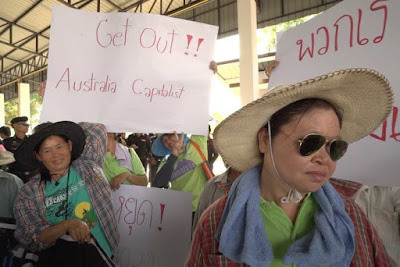 "We're not against development but we can't trade development for people's lives, for sickness and suffering," campaigner Suekanya Sintornthammathat — the last resident left in Ban Khao Mor, the village closest to the mine's boundary, said. One protester at the ministers' meeting held a placard saying "Get Out Australia Capitalists", while a small girl clutched a handwritten sign showing her levels of arsenic, manganese and cyanide. The levels of heavy metals have been used by both sides to push their very different agendas. The Chatree mine is located 280 kilometres north of Bangkok and is the country's only major gold mine, employing 1,000 Thai staff. It is a low-grade, open-cut operation, meaning its operators blast rock from a huge mine pit and use cyanide to extract the fine gold particles from the rubble. The company's use of cyanide is considered world standard and tests have shown no problems with the level of cyanide in the bodies of staff or locals. What has been more contentious is the manganese and arsenic — both substances that can cause serious health problems such as Parkinson's disease and various cancers. Manganese and arsenic occur naturally in the soil around the mine. The allegation from opponents is that the mine's blasting and transportation of rocks is increasing the amount of these toxins in the dust and water. 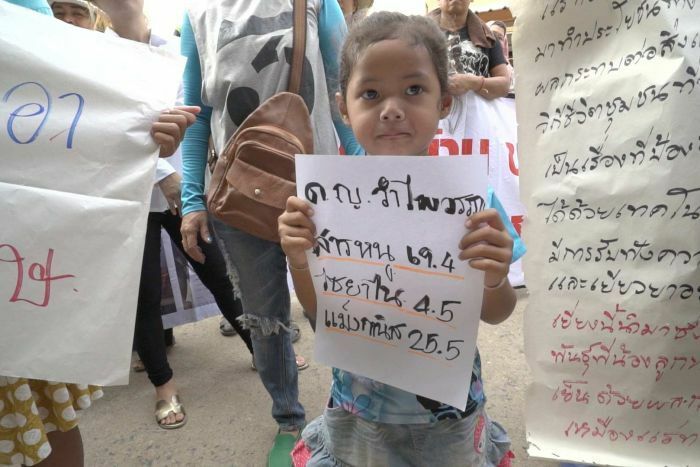 A study overseen by Thailand's Ministry of Public Health last year tested 1,004 people living near the mine and found 41 per cent had manganese levels '"above the standard". About 20 per cent had levels of arsenic "above the standard". The problem is there has been no clear "standard" for safe levels of exposure for these substances in Thailand. The Public Health Ministry study used the range of 4-15 micro-grams (ug) of manganese per litre of blood and 0-50 ug of arsenic per litre of urine, as benchmarks for what is normal. By comparison, Safe Work Australia is more generous, saying arsenic levels below 100 ug/L are considered normal, with readings above 150 considered "excessive exposure". 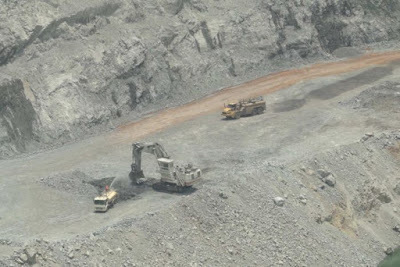 Akara Resources and its major shareholder Kingsgate has not denied the existence of elevated levels of manganese and arsenic, but said the exposure was normal and could not necessarily be linked to the mine. "The slightly elevated levels of arsenic and other things are only slightly [up], none of them are earth-shattering, none of them are a problem," Mr Smyth-Kirk said. The mine has also done its own health tests on staff and the community up to 50 kilometres away. The most recent results show about 14 per cent of local residents had arsenic levels about 50 ug/L. More concerning are the results that show 70-80 per cent of those tested had manganese levels above 10 ug/L — the level considered by Akara Resources to be "normal". Company management told the ABC anyone with high readings was invited for further medical checks at the company's expense. 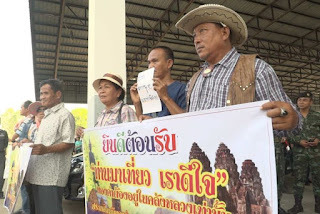 Last year Thailand's Ministry of Industry asked for a major review of community impacts, which was done by the international mining industry consultants Behre Dolbear and paid for by the mine. It found "low arsenic/manganese impact" and overall "no negative impact" to community health. In terms of arsenic two complicating factors have been raised. One is that some foods — particularly seafood and rice — are high in arsenic and can cause short-lived spikes in test results. The other is that arsenic comes in two forms — organic arsenic is found naturally in food and is considered not very toxic, but inorganic arsenic is what is in the soil and is thought to be much more dangerous. A test to isolate which sort of arsenic is in the urine test is more expensive (about $80 a sample) and is not being conducted by either side. This means it is difficult to tell how much arsenic is coming from the local diet and how much might be coming from the mine. The issue is complicated and not well understood in the community. One former subcontractor at the mine complained of extreme lethargy and showed the ABC bruises on his torso that he said was evidence of arsenic poisoning. He could not remember the name of the doctor in Bangkok who told him he had arsenic poisoning. The man referred the ABC to another doctor occasionally employed by the mine to collect specimens, but she said the bruising was an unrelated skin problem and his lethargy was cause by thyroid issues. Campaigners claim up to 500 people have become sick and dozens have died, but did not provide evidence linking ill health to the mine. The claims come as the mine's future hangs in the balance. On May 13, the company's metallurgical license expires and operations could be stopped. Thailand's military government is under considerable pressure in Bangkok over its plans to limit democratic systems and wants to be seen to care about the concerns of its citizens in the countryside. "We came to listen to everyone," Thailand's Public Health Minister Piyasakol Sakolsatayadorn said as he fronted protesters. "You complain that it's taking a long time but this decision must happen in one or two months from now, I guarantee it." Mr Smyth-Kirk has tired to shrug off the impending decision. "It's critical but it shouldn't be a major problem," he said. Mr Smyth-Kirk said the mine had about seven years of production life left, but that the approval of other exploration permits could see operations continue for two decades. Many local residents the ABC spoke to supported the mine for the economic opportunities it has brought. "Since the beginning, when they started clearing the jungle, my three sons have been working with them," resident Khampan Lue-aye said. "There are no health problems, it's all normal — when people are sick, the mine helps them." 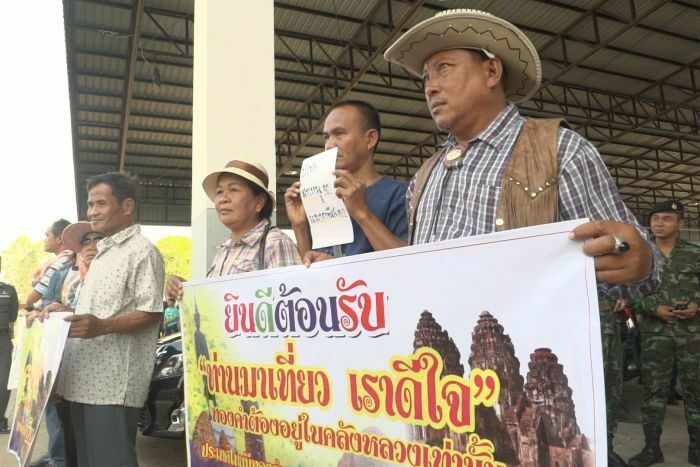 But farmers opposing the mine are digging in their heels — backed by some academics and non-government groups in Bangkok — so it's likely the controversy will continue over the community impacts of gold mining in Thailand.